Thinking about restoring your decking, driveway or patio and want them looking new again? DMC facilities management cover all types of pressure washing tasks within the Milton Keynes area. Using our pressure washer system we can clean away almost anything and on most surfaces including dirt, algae and grease build up, making the surface look like new again. We take pride in how we finish the surfaces and include re-sanding and sealing if required. We can also help seal newly laid areas once they have been bedded in. We understand that first impressions count, it is important to keep your property or business looking clean, to create a professional and welcoming impression for your visitors. If the outer or inner building is kept dirty and unkempt it can reflect on how people perceive you and your business. DMC Facilities management understand how image is important and take great pride in insuring that we complete tasks to a high standard, giving 100% customer satisfaction. DMC will use the latest equipment to restore different hard surfaces to bring it near to the original condition. Our professional Milton Keynes team like a challenge when it comes to using our pressure washing and steam cleaning equipment and are dedicated to get the best outcome possible. In the past we have covered areas such as patios, driveways, full cleaning of building and even graffiti removal. 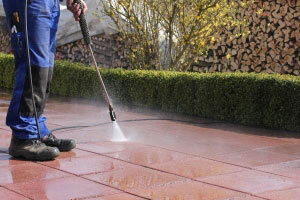 We can also use our pressure washing system on statues, monuments, swimming pools, tennis courts and much more. We are fully committed to insure you receive a high level cleaning service. We comply with the latest legislations making sure we work in the safest possible way. We like to work with our customers to provide a service that is time and cost effective. We offer services all year and 24 hours a day allowing customers to find a time that is most convenient for them. Needing something pressure washed and looking new again in the Milton Keynes area, call us today on 01525 500 100.